This example provides an overview of the Symbolic Math Toolbox which offers a complete set of tools for computational and analytical mathematics. For more details see Getting Started with Symbolic Math Toolbox. For more details on documenting and sharing your mathematics see Live Scripts. Variables in MATLAB are by default double-precision. The Symbolic Math Toolbox extends this by allowing you to express numbers in exact symbolic form using sym and with variable-precision using vpa. Symbolic variables can be used in mathematical expressions, functions and equations including trigonometric, logarithmic, exponential, and special functions. You can create symbolic expressions and perform mathematical calculations on them. You can also create piecewise functions. Create and evaluate functions. Find the value of f at x=-5. Find the intersection between lines y1 and y2 using solve. Equate the lines using the == operator. Make assumptions on symbolic variables. There are 4 solutions to x4=1, two real and two complex. Assuming that x is real and x>0, there is only one solution. The Symbolic Math Toolbox supports evaluation of mathematical functions by substituting for any part of an expression using subs. You can substitute numeric values, other symbolic variables or expressions, vectors, or matrices. The Symbolic Math Toolbox supports the solving of equations and systems of equations using solve. It supports solving multivariate equations, solving inequalities and solving with assumptions. Solutions can be found symbolically or numerically with high precision by using variable-precision arithmetic. Substitute multiple values. For example, evaluate cos(a)+sin(b)-e2C by substituting a=π2,b=π4,c=-1. Create and solve equations. Find the zeros of 9x2-1=0. Solve the general quadratic equation ax2+bx+c=0 and use subs to evaluate that solution for a=9,b=0,c=-1. Solve equations symbolically or with variable-precision arithmetic when exact results or high precision is needed. The graph of f(x) = 6x7−2x6+3x3−8 is very flat near its root. The Symbolic Math Toolbox supports the simplification and manipulation of mathematical functions. Most mathematical expressions can be represented in different, but mathematically equivalent forms and the Symbolic Math Toolbox supports a number of operations, including factoring or expanding expressions, combining terms, rewriting or rearranging expressions, and simplification based on assumptions. Perform polynomial multiplication and simplify the results, show that (x-1)(x+1)(x2+x+1)(x2+1)(x2-x+1)(x4-x2+1) simplifies to x12-1. Apply trigonometric identities to simplifications, for example sin2(x)=1-cos(2x)2 . Factor or expand multivariate polynomials. Find the functional composition f(g(x)). The Symbolic Math Toolbox has a full set of calculus tools for applied mathematics. It can perform multivariate symbolic integration and differentiation. It can generate, manipulate, and perform calculations with series. Find the derivative of ddx(sin(x)). Find the derivative of ddx(x2+sin(2x4)+1) using the chain rule. Find the indefinite integral ∫f(x)dx for f(x)=e-x22. Find the definite integral ∫abf(x)dx for f(x)=xlog(1+x) from 0 to 1. 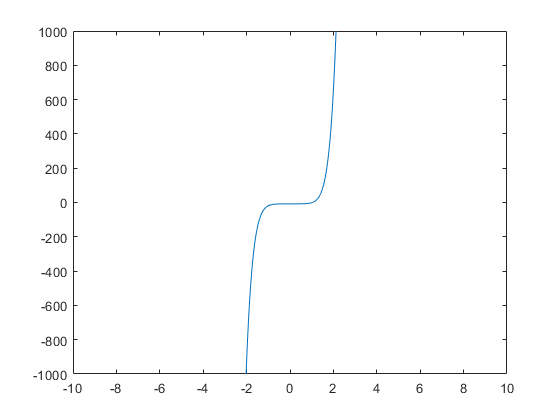 Show that sin(x)x=1 at x=0 by computing the Taylor series expansion ∑(x-a)nf(n)(a)n! for f(x)=sin(x)x around the point x=0. 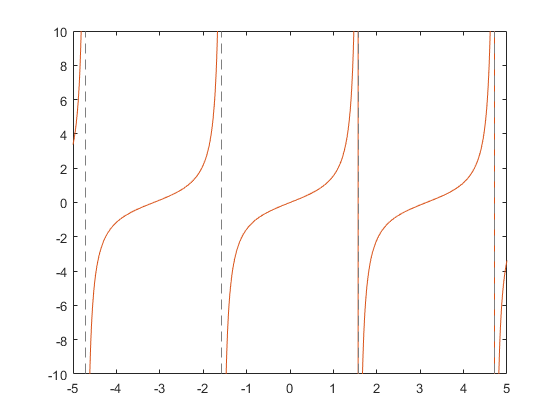 Show that tan(x) is discontinuous at x=π2 by showing that the left and right limits are not equal. limx→π2+tan(x)≠limx→π2-tan(x). 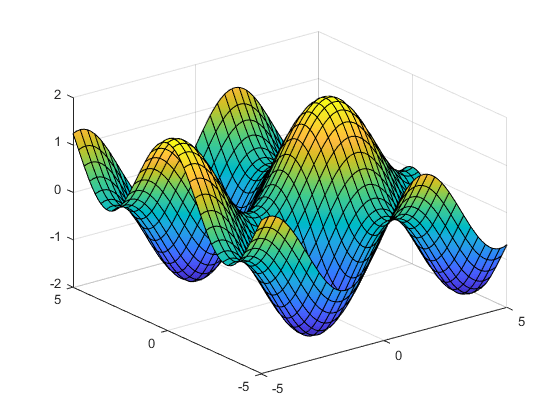 The Symbolic Math Toolbox can analytically solve systems of ordinary differential equations using dsolve. Solve the first order ODE dydx=-ay. Solve the same ODE with the initial condition y(0)=b. Solve the system of coupled first order ODEs dxdt=y and dydt=-x. The Symbolic Math Toolbox can work with symbolic vectors and matrices. It can compute eigenvalues and eigenvectors of symbolic matrices. Find the determinant of A. Find the eigenvalues of A. 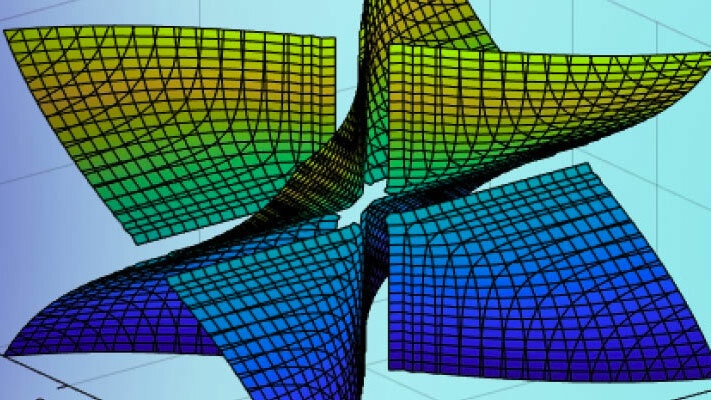 The Symbolic Math Toolbox supports analytical plotting in 2D and 3D. Plot the parametric curve x(t)=t*sin(5t) and y(t)=t*cos(5t). 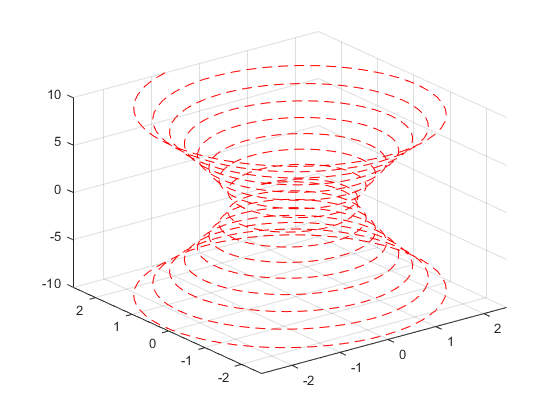 Plot the 3D parametric curve x(t)=e|t|10sin(5|t|), y(t)=e|t|10cos(5|t|) and z(t)=t from [-10,10] with a dashed red line. 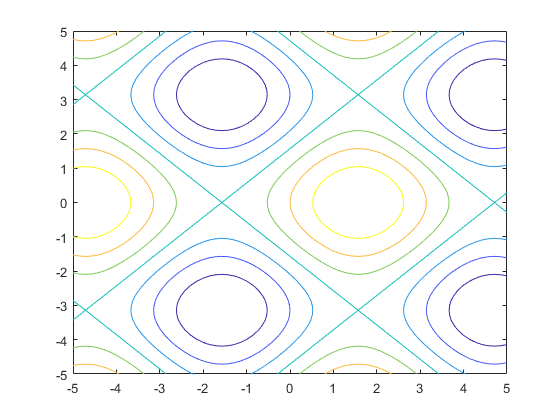 Plot the 3D surface f(x,y)=sin(x)+cos(y). 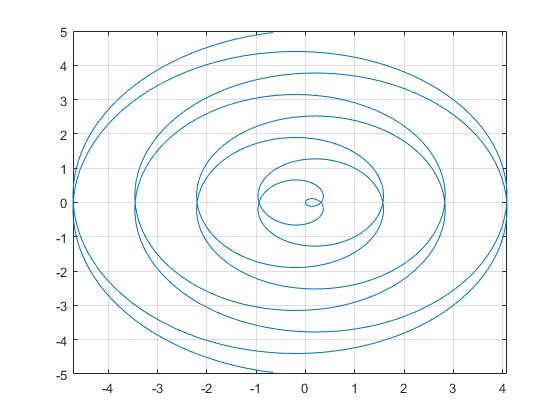 Plot the 2D contours of the same surface.